Lyrics to the song Girl Of My Best Friend as recorded by Bryan Ferry. How long I can I pretend? What if she got real mad and told him so? Originally a hit by Elvis Presley. 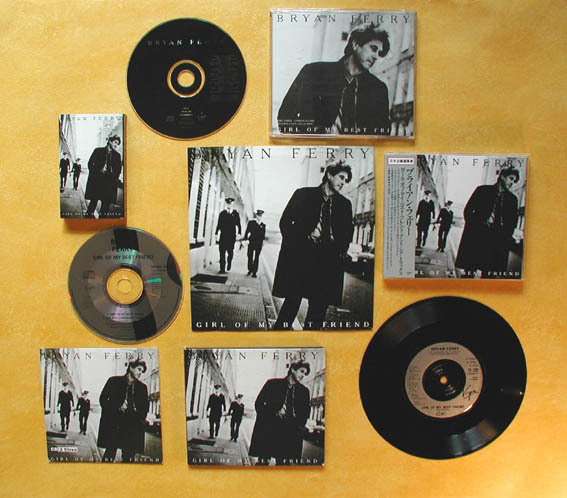 This was the 3rd single released from Bryan Ferry's Taxi album. It reached number 57 in the UK charts. Bryan has never performed this song live. This single was one of 3 Elvis Presley songs recorded by Bryan during the 'Taxi' sessions. 'Are You Lonesome Tonight?' was used on the soundtrack to the film 'Honeymoon In Vegas' released a year earlier. This song was uses as the b-side to this single as well as appearing on the CD single. The CD single also featured the instrumentals Nocturne & Valentine (Instrumental) on CD for the first time. These tracks were originally released as the b-sides to Don't Stop The Dance & Slave To Love.